Edward Zamber, President, Abso-Clean Industries, Inc. PROBLEM: Abso-Clean Industries, Inc., of Detroit, MI, needed to increase production capacity for several liquid abrasive cleaners. More mixing tanks and floor space would be required to keep up with demand if existing propeller stirrers were to be used. In addition, several of the powder abrasives which were being introduced into the liquids tended to settle out after a few months. There was alarm and concern regarding the storage life of the products. Abso-Clean researchers set out to find a process improvement that would eliminate the production bottleneck and extend product shelf life. A field sales engineer from the local representative of a reversible homogenizing mixer manufacturer provided assistance. 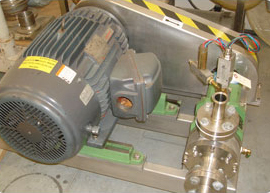 SOLUTION: A 15 HP, 3600 RPM reversible homogenizing mixer with a 5.75" diameter rotor was purchased for use in the existing 500 gallon mixing tank. 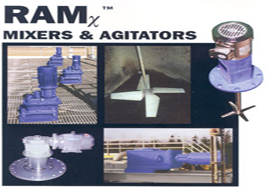 A stellite mixing head bearing was installed to provide the greatest resistance to the abrasive cleaner compound. 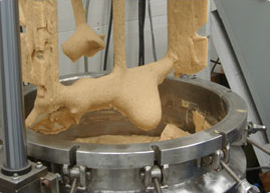 The reversible homogenizing mixer is lowered into the tank by an overhead hoist. 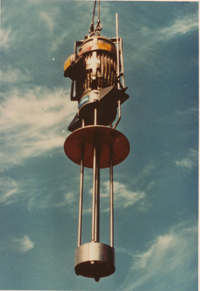 The stator/rotor/stator mixing head is positioned near the pitched bottom of the vessel. The unit is first operated in the down-mode to quickly draw in and wet out all of the abrasive powders and stabilizers. 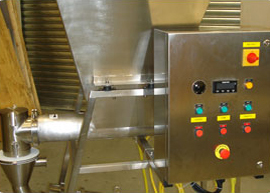 Following the additional step, it is operated in the up-mode to vigorously disperse the ingredients into all areas of the mixing vessel. 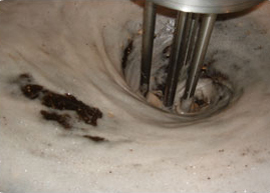 A final down-mode sweep of the bottom of the tank completes the mixing cycle. 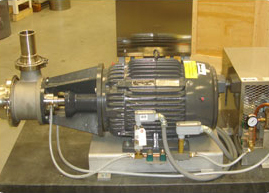 The reversible homogenizing mixer works on the principle of a submerged pump. 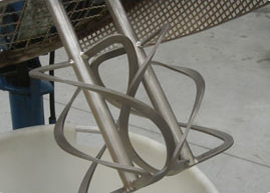 As the shaft rotates, the multi-bladed, axial flow rotor draws the fluids into the mixing head housing. A combination of intense mechanical and high hydraulic shear results as the fluid impacts with the rotor and interior housing surfaces. The action is intensified as the material passes through three close clearance zones. RESULTS: The rotor and stator parts on the reversible homogenizers have not needed replacement after two years of operation with the abrasive powders. The unit effectively wets out powders that are prone to float or stick together. The intensive up-mode disperses and separates dry powder agglomerates and also provides fine grain emulsification. Mixing time was cut in half and long term shelf life stability was attained. The experience with the reversible homogenizer on several abrasive cleaners prompted Abso-Clean to purchase another unit for producing floor cleaners, metal cleaners, paint booth coatings and paint deflocculants. Customer satisfication is at an all time high since the products mixed by the unit are dispersed so thoroughly that there is no settling even after a year's storage.